As a mean to boost future scientific publication of the students, MD FEB UGM invited Ferrie Jie to give a public lecture entitled: “Some strategies and Tactics to Publish International Publication.” Ferrie Jie himself is an associate professor in operation management at School of Business and Law, Edith Cowan University, Australia. He has more than 77 publications in several international journals. Some of the journals are International Journal of production research (IJPR), International Journal of Supply Chain and Operations Resilience, Asia Pacific Journal of Marketing and Logistics. 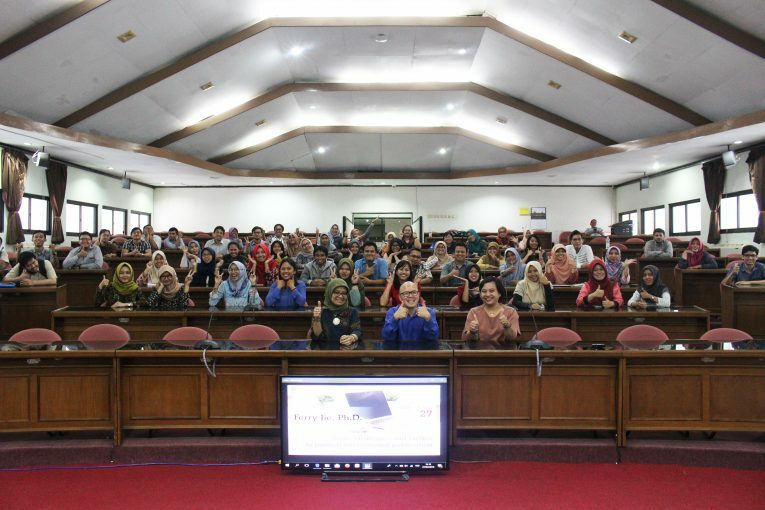 The public lecture was opened by the Director of Master of Science and Doctorate Program in Management, Nurul Indarti, Sivilokonom.,Cand Merc., Ph.D. She remarked that this public lecture is one of the effort to provide the student with an exposure in scientific forum and publication. Based on that quote, the speaker wanted to emphasize the core job of academician is to do high-quality research. The quality itself is measured by the contribution of the research to the body of knowledge and practical contribution. Jie then warned the students although publication is important, they must carefully select the journal. As there are “predatory journals” Predator journal is journal which demands a high sum of money to the authors of the article if the authors want to publish their article in the journal. Jie then lists some challenge in publishing article in an international journal. The first challenge is the long reviewing process after journal submission. Furthermore, most of the journals only published twice in a year. The second challenge comes from the numbers of submission in the journal because submission is come from across the world. Due to this, the competition to get published in an international journal is very tight. Jie also gave several tips to convert student’s thesis into publishable articles. The thesis itself can be breakdown into several articles but one need to give extra care when writing several articles from one thesis. The extra care is needed due to the possibility of conducting self-plagiarism. Another thing that has to be examined is the writing format of the journal. “Before submitting your paper, please read four to five articles from the journal that you want to submit, to know the writing format from the journal” Jie Said.